Edited to add: Be on the lookout for this garden pest if you grow herbs such as sage, lavender, rosemary, mint... and even thyme. One London reader, whose rosemary was host to a colony of these beetles, commented, "from noticing the first little bites on the plant, it only took about a week for it to be totally beyond rescue." Vigilance and daily checking are key. Do not be fooled by the attractive plumage of this beetle. This handsome fellow is a predator of the first order and should be destroyed on sight. I spotted him yesterday evening when, as the sun came out, it just glinted off the shiny back of the insect. I was looking over the various herbs in my patch and was lucky to be in the right place at the right time. Although undoubtedly very beautiful to look at, I remembered seeing a warning poster during my day out at Jekka McVicar's herb farm and I was certain this could be the very culprit. It was the bold jewel coloured stripes that reminded me so I continued to squish and search by hand brushing through my herbs. I found three in a short space of time. The adult rosemary beetle, also known as Chrysolina Americana, feeds on the new growth of lavender, mint, sage, rosemary and thyme. In short, you could have your entire essential kitchen herbs wiped out in a season. As the beetle seems to prefer to feed on Lamaceae plants, it's thought that others in the family may also act as hosts to this pest. Rosemary beetles originate from Southern Europe and were first seen in the UK in the early 1990's; they are now prevalent across the country. More info on the RHS site here. 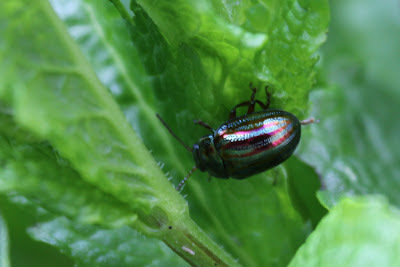 They are destructive enough to warrant the RHS carrying out research on this bug - there is an ongoing survey so, if you are unfortunate enough to find this beetle in your garden, please take a photo (if possible) and complete the online form. There is a link to the survey on the RHS page about the beetle. I spoke to Jekka today who confirmed my suspicions. She farms all her herbs organically and suggested the following method of control: Get hold of a yellow sticky trap (a google search will offer plenty of outlets or ask your local garden centre), peel back one side to expose the sticky surface and lay it flat on the soil under the infested plant, sticky side up. Gently tap the plant so that the beetles fall onto the trap. Destroy. Jekka also reminded me that the RHS are the only people doing valuable and essential entomological research on this subject and, as gardeners, it's vital that we support the RHS, if we can, by becoming members - with the bonus that you can get entry into some spectacular gardens and get lots of advice, if needed. I've heard so many people bemoaning the "dreadful weather" this last week: wind, rain, sunshine, as well as thunderstorms today. Welcome to April in the UK. (I think it's great.) There's a hosepipe ban in the south so all this rain is sending deep reserves of water into the ground and the veg and fruit will be fully refreshed. Luckily I was able to find time to go down to the veg garden on Monday where I got quite a lot done. I stayed really focused as I thought it might rain at any moment! Meanwhile, back upstairs in my flat-turned-greenhouse, the artichokes, dill, borage and melon seeds have all germinated and been potted on successfully. They'll stay upstairs for a few weeks until they're strong enough to fend for themselves in the veg garden. I sowed a tray of 12 Jiffy 7s with bell peppers (purple and orange), capsicums and chillis and the seed saved from my Yellow Banana chilli grown last year (the one still fruiting at Christmas). I reckon the son of that plant deserves a space on the windowsill this year if I can successfully nurture it to maturity. I suspect it's not really called Yellow Banana but the plant came from Homebase when the fungus gnats munched my own chillis into oblivion and that was the name conferred on it there. The seeds went into the modules at the beginning of April and are over an inch high already. I hope this bodes well for raising mature plants as I may have left sowing them a bit late. The best part of the week is that I've enjoyed the first of my perennial cauliflowers! The main cauli head was quite large so I cut just a few chunky stalks. It was cooked with the sprouting stalks from the bolted Brussel Sprouts plants and both were utterly delicious. (Served up with just butter, salt and pepper. Yum.) I wondered in my previous post whether the sprout stalks would be edible and now I know that they are. They were not unlike PSB so it's good know that the sprout tops and stalks can still be eaten even after the plant has bolted. Lesson learned: don't be hasty in chucking your bolted winter veg onto the compost heap. I can honestly say I enjoyed every mouthful of that particular lunch. Tomorrow I'm off early for a long drive to Bristol. Jekka McVicar's herb farm hosts occasional Open Days with talks by Jekka and farm tours around the herbs. I'm booked onto the workshop "How to Design a Herb Garden" which I treated myself to for my birthday last month. I'm really excited to be going, even though the weather forecast is not good, and I'll hopefully be able to post all about it when I get back. Today started by looking at clear blue skies with a good stiff breeze. Rubbish for taking photos (the above was taken yesterday) but perfect for pottering around the patch and sowing peas and beans as long as I'm quick! The veg patch only gets sun until midday and there was quite a chill in the wind yesterday so this is a day to be getting on with things. First though, I have a(nother) book to review. Following on from my review of Garden Crafts for Children, Green Crafts for Children is another good start for beginner crafters and I mention it here only because a few of the skills can be taken outside. I'm thinking about the Gardening with Children group on UK Veg Gardeners - there's a running theme of how to keep the children occupied for a short while so that adults can complete some of the more mundane, but essential, tasks in the allotment or garden. Most children won't need much prompting to rush off den building or exploring but there will, inevitably, come a time when they've had enough but the adult hasn't (if you're anything like me... ). I rather like this project from the book ... ! P.S. I was right about the wind - it's been very nippy today as well and the early sunshine was quickly covered by clouds. Hope it warms up soon! Well, yesterday's book review post went down well, didn't it? Not a single comment! I've silenced you all. I'm hoping after a rather long break from blogging (sorry) that you'll all bear with me while I review some of the books I've been sent. I've got one more craft book, a balcony gardening book and - the one I'm really looking forward to - Martin Crawford's How to Grow Perennial Vegetables, which arrived unexpectedly a few days ago and I'm quite excited about. I've a feeling that one is going to be a real winner. I wonder if I could eat them? They look so like broccoli, I can clearly see them steamed and served with a drizzle of olive oil or butter and quick grinding of pepper and a sprinkle of sea salt... Hmmm, perhaps time I had some lunch. On the plus side, I have 100% germination of my pink broad beans (I'm only growing nine plants as I've yet to discover whether I like them) and the herbs, garlic, onions and potatoes are all coming along nicely. I also have one or two cauliflowers ready to be picked (more on this later) and the fruit trees are in blossom. I planted a cowslip in the veg patch last summer as the plant provides food for butterflies. It's looking a bit wind whipped at the moment but has trebled in size and is a real splash of welcome colour (and edible to boot). All in all, a well spent couple of quid in the supermarket. Self-seeded sunflowers are popping up everywhere. I don't want them to completely monopolise the space (I have no idea whether these will be small or giant sunflowers) so I've been nibbling on a few of them and adding them to salad. They taste a bit like watercress, tasty and succulent. I'm going to grow a pot specifically for adding to salad leaves - the same technique as growing pea shoots and baby spinach leaves for a salad bowl. These were photographed this afternoon and are runners transplanted a couple of weeks ago. Amazing what a week or two of sunshine and rain will achieve! Regular readers here will know that, on occasion, my gardening efforts are besieged by a few mini-gardeners. They love to help out but, despite the magic of growing food from tiny seeds and the delights of watering, they'll soon be casting around for distractions. The promise of a crafting activity will sustain interest and this is where the two books I've received from Cico Books would come in very handy. The first is Dawn Isaac's new book Garden Crafts for Children. You may already know Dawn Isaac through her blog, Little Green Fingers (or through her writing in the Guardian), in which case you'll have seen some of her clever ideas woven through the gardening she does with her own children. I reviewed it with a fairly experienced eye as I've been crafting since childhood and used to teach a primary school arts club. For that reason, I would have liked to see a nod to health and safety in the garden as some of the book's audience may be new to this area of crafting. As gardeners, we're already aware (I hope) of the plants that sting, poison or cause nasty rashes and of the potential hazards of cat poo, garden canes without tops and behaving sensibly around beneficial bugs. Without wishing to be over cautious, teaching basic garden safety gets everyone off to a good start. So, after all that, what's in the book? Stylish outdoor projects that will help to glam up your garden (or allotment) include an insect hotel, a sunflower walk, bean archways and - wish I'd thought of this - scented hopscotch. Expect to see some of these fab projects appearing in my veg patch over the summer months. Indoor projects include herbal bath bags, easy flower soaps, garden lights amongst many others. There are clear instructions for mini gardens that will provide hours of play long after the activity is finished. Two small (and very pedantic) niggles: Some of the ideas, such as planting into welly boots and growing cress caterpillars, have been around for a while and feel like page fillers. I appreciate that these are quick crafts for very little children but feel there's many more crafts that could have replaced these. Having said that, the dinosaur world is wonderful ... love the re-use of an old tyre. Secondly, this UK book appears to be aimed at the American market. I'm aware that the interest in crafting is strong in the US but americanised phrases throughout became irritating. We're given rain boots, cookie cutters, Popsicle sticks, thrift stores, etc, with the Anglicised version in brackets. Call me patriotic, but I'm annoyed at being downgraded to second place especially as the author, and publisher, is British. So would I recommend it? Unreservedly. Dawn Isaac is a trained garden designer and her children are given free reign in her family garden. This book draws on that experience and has a lot to offer. Even though many projects were familiar to me, there's still plenty to inspire. Newcomers to crafting will easily be able to follow the projects and keep the kids amused over even the very long summer holidays. My thanks to Cico Books for sending me a copy to review. 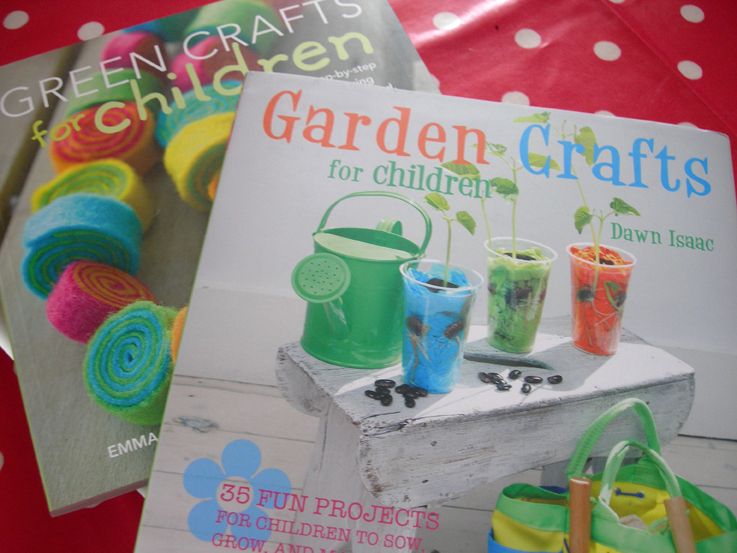 I've also been sent Green Crafts for Children, a book published last year but worth mentioning as there are several projects which, although not labelled as such, would be great in the garden. My review will appear tomorrow.